The topic of this article may not meet Wikipedia's notability guideline for biographies . Please help to establish notability by citing reliable secondary sources that are independent of the topic and provide significant coverage of it beyond its mere trivial mention. If notability cannot be established, the article is likely to be merged, redirected, or deleted. The Bridgeport Sound Tigers are a professional ice hockey team playing in the American Hockey League (AHL). They are the AHL affiliate of the National Hockey League's New York Islanders, who also own the franchise, since its inception. The team is based in Bridgeport, Connecticut and play their home games at the Webster Bank Arena. Steve Stirling is an assistant coach of the Binghamton Senators of the American Hockey League. He is the former head coach of the American Hockey League's Norfolk Admirals, the Springfield Falcons, and the National Hockey League's New York Islanders. Eric Boguniecki is an American former National Hockey League player and a current assistant coach for the Bridgeport Sound Tigers of the AHL. Trevor Gillies is a former Canadian professional ice hockey player who last played with the South Carolina Stingrays of the ECHL. He has played in the National Hockey League (NHL) with both the Mighty Ducks of Anaheim and New York Islanders. Gillies was primarily used as an enforcer, as evidenced by his career NHL statistics of 57 games with only three points and 261 penalty minutes. John A. Stevens is a Canadian professional ice hockey coach and former player. He is the former head coach of the Los Angeles Kings and the Philadelphia Flyers of the National Hockey League (NHL). Stevens was a defenceman for the Flyers and Hartford Whalers during his playing career. Stevens was born in Campbellton, New Brunswick, but grew up in Turkey Point in Norfolk County, Ontario. Stephen Michael Gionta is an American professional ice hockey centre for the Bridgeport Sound Tigers of the American Hockey League (AHL) while under contract to the New York Islanders of the National Hockey League (NHL). He formerly played with the New Jersey Devils. Gionta is the younger brother of Brian Gionta, who played for the Devils from 2001 to 2009. Christopher Ray "Chris" Bourque is an American professional ice hockey forward, currently playing with the Bridgeport Sound Tigers of the American Hockey League (AHL). Originally drafted by the Washington Capitals of the National Hockey League (NHL), he has played 51 NHL games for the Capitals, the Pittsburgh Penguins and the Boston Bruins. Brent Keith Thompson is a Canadian retired professional defenceman who played 121 games in the National Hockey League. He played for the Winnipeg Jets, Phoenix Coyotes, and Los Angeles Kings. He was formerly the head coach of the Alaska Aces of the ECHL, where he led them to a Kelly Cup Championship in the 2010-2011 season. During the 2011-2012, Thompson was the head coach for the Bridgeport Sound Tigers of the American Hockey League, affiliate of the New York Islanders of the National Hockey League. In June 2012, the Islanders announced that Thompson would be promoted to Assistant Coach under Islanders Head Coach Jack Capuano. To start the 2014-2015, Brent Thompson was once again named the head coach for the Bridgeport Sound Tigers of the American Hockey League. His son, Tage Thompson, was selected 26th overall of the 2016 NHL Entry Draft by the St. Louis Blues. Andrew MacDonald is a Canadian professional ice hockey defenceman currently playing for and an alternate captain of the Philadelphia Flyers of the National Hockey League (NHL). Gregg Johnson is an American professional ice hockey forward who is currently a Free Agent. He most recently played for the South Carolina Stingrays of the ECHL. Trevor Smith is a Canadian professional ice hockey centre who is currently playing with the San Antonio Rampage in the American Hockey League (AHL). Brett Motherwell is an American former professional ice hockey defenseman who played in the American Hockey League (AHL), the ECHL, and the Austrian Hockey League. Cail MacLean is a Canadian retired professional ice hockey player and the head coach for the Stockton Heat of the American Hockey League. Benjamin Scott Holmstrom is an American professional ice hockey center who currently plays for and is the captain for the Bridgeport Sound Tigers in the American Hockey League. 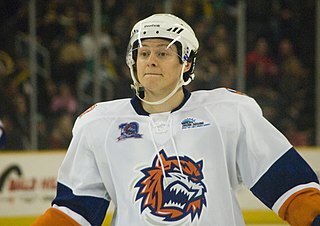 His brother Josh Holmstrom is a teammate with the Sound Tigers. Rhett Thomas Rakhshani is an American professional ice hockey forward, currently contracted by the Frölunda Indians in the Swedish Hockey League (SHL). He was selected by the New York Islanders in the 4th round of the 2006 NHL Entry Draft. Rakhshani is of Iranian-German-Mexican-American descent. Keith Seabrook is a Canadian former professional ice hockey player. He played four seasons in the AHL for the Abbotsford Heat, Manitoba Moose and San Antonio Rampage and the Rockford IceHogs and one season in Italy's Serie A for the HC Pustertal Wölfe before taking a time-out from hockey midway through the 2012–13 season. Russ Sinkewich is an American former professional ice hockey defenseman. He last played with the Idaho Steelheads of the ECHL. Parker Milner is an American professional ice hockey goaltender currently playing for the South Carolina Stingrays of the ECHL while under contract to the Washington Capitals of the National Hockey League (NHL). Kane Lafranchise is a Canadian former professional ice hockey defenceman. Connor Jones is a Canadian professional ice hockey forward who is currently playing for the Bridgeport Sound Tigers in the American Hockey League (AHL). He has appeared in the National Hockey League (NHL) with affiliate, the New York Islanders. ↑ SooToday Staff (2006-07-17). "Soo native Dan Marshall named coach of AHL's Bridgeport Sound Tigers". SooToday.com. Retrieved 2008-12-07. ↑ "DAN MARSHALL NAMED SOUND TIGERS HEAD COACH". NHL.com. Retrieved 2018-09-11. ↑ "Tracking ex-Sound Tigers coaches". Connecticut Post. 2012-06-28. Retrieved 2018-09-11.